If you’re looking to give your sleep situation a huge upgrade without giving your bank account balance a huge downgrade, we have the perfect sale for you. 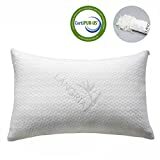 Amazon is currently slashing $11 and change off the price of the LANGRIA Luxury Bamboo Shredded Memory Foam Pillow, which is a very well reviewed pillow that’s already quite affordable. It features a comfortable cover along with viscoelastic CertiPUR-US approved foam filling that’s hypoallergenic and adjustable, so you can make the pillow more or less firm depending on your preference. $28 is a great price for this pillow, but the coupon code D99P2NUE drops the price all the way down to $16.79 for a limited time.